One of the most important responsibilities of a surrogate mother is to take care of herself. You want to remain physically and mentally fit. If you are used to heavy workouts, pregnancy might seem challenging for you. At one point, you will have to stop running or doing other high-impact exercises. If you are not used to heavy workouts, pregnancy is a good time to start getting fit. But be careful. Pregnancy is not a good time to start a heavy workout program. Here are a few fitness tips for surrogate moms. Take stock of your current fitness regime. You want to maintain as much as possible of what you have been doing. However, you don’t want to radically increase exercising. If you have already been on a fitness program, consult your physician to determine when you should reduce your activity, and by how much. Your physician might give you additional cautionary advice: for example, to stop certain exercises, but not others. Or to change some aspects of exercises you do. If you have not been on a fitness program and you want to start one, consult your physician. It is critical that you don’t overstretch what a pregnant body can fully absorb. Choose low-impact exercises. Yoga and swimming are highly recommended. Avoid routines that involve jumping or straining muscles. Daily pelvic floor exercises will help keep your back strong and help you better control your tummy when pregnancy is over. Whatever routine you follow, make sure to ease into it with a warm-up and ease out of it with a cool-down period. Remember that a pregnant body uses more energy and more oxygen, because it is feeding and growing a child even as it exercises. Learn to measure your pulse, and stop or slow down before overdoing it. If you feel faint, stop or slow down. If you get tired, it’s OK to take it easy. Keep hydrated. Drink before, during and after exercise. Water is the best hydration. Keep cool. Water helps, but make sure to exercise where the air is on the cool side rather than on the warm side. If you start to feel overheated, slow down. Talk with the intending parents. They will be happy to know that you are keeping fit, and they will also be pleased to know what measures you are taking to make sure you don’t overdo it. Don’t forget that part of fitness is your diet. Make sure to eat lots of fruits and vegetables for a natural source of vitamins and minerals. Protein is also important for growth, and the baby will need that growth. And don’t forget to remove stress from your life. 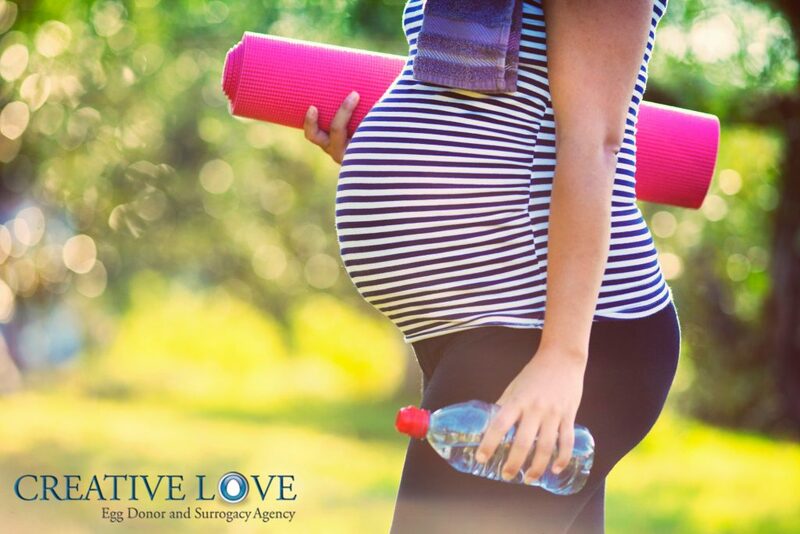 Ideally, before even deciding to become a surrogate mother, you can get your finances in order and rearrange your daily routines to reduce stress. Nap often. Take as much time as you need to rest. Your body is working overtime on the baby growing. Follow these fitness tips for surrogate moms, and you’ll give birth to a healthier baby and a healthier you.